Celese and I met during one of my son's baseball games about three years ago and soon became friends. She and I are very similar in some ways: we're both perfectionists, creative, and very detail oriented in the work that we do. Around the time we first became friends, I was organizing a big open house party at my job and I hired her as my party planner. We were in harmony with our thinking and at times I felt like I had met my clone. We just clicked. I don't think I've ever met anyone in my life that's as as strong as a person as she is. Over the last year and a half, her life has been a Lifetime Original Movie script acted out, scene by scene in front of my eyes. I won't get into the specifics but she and her family have been dragged through the mud this year. It absolutely breaks my heart to see such an amazing person have to go through what she has. I have done what I could for her during this time, but mostly I've tried to stay out of her way unless she needs me. When she does it's usually because she just needs a break from the chaos. My job is to get her laughing to the point of tears. This usually involves a trip to the mall where we make fun of ugly clothes at Christopher & Banks (sorry C&B lovers, but there are some serious "What Not To Wear" contenders in that store!) and eat a good meal. She keeps on keeping on, day by day, with a big smile and infectious laugh. She's focused, incredibly intelligent, and a force to be reckoned with. She's one tough cookie and I love her to death. When I asked her what she wanted for her birthday treat this year she said she wanted something with lots of nuts, chocolate, and a wee bit salty. 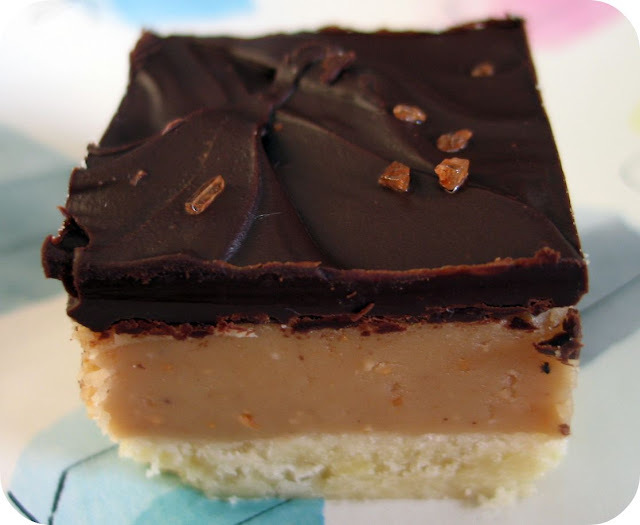 At first I was just going to make her cashew butter fudge but then I thought it would be really well complimented by a simple shortbread cookie base and a bittersweet chocolate top that had been sprinkled with just a skosh of red Hawaiian sea salt. Although this part is optional, I highly recommend it. It's unexpected and makes all three flavors pop in your mouth. Yield: You can get anywhere from 24 big pieces to 40 smaller 2-bite pieces depending on how you cut it. 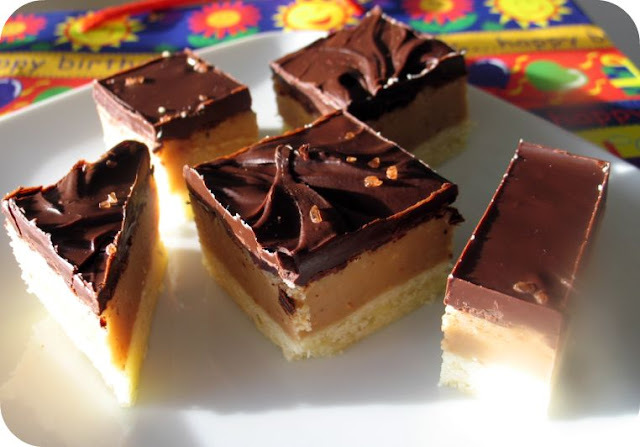 Since the fudge and chocolate are so rich and oh so sweet, I opted for cutting them slightly on the smaller side. Line a 8x8" baking dish or cake pan with wax or parchment paper so it comes up and over the sides of the pan. Butter the paper. Preheat the oven to 350F. 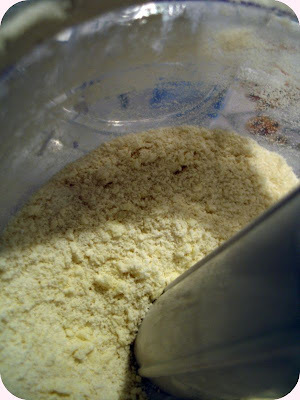 Combine the flour, sugar, powdered sugar, and salt into a food processor. Pulse on high 3 or 4 times until mixed. 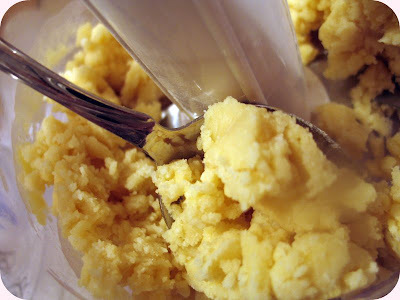 Add the butter and pulse 12 times or until the dough looks like coarse and lumpy. 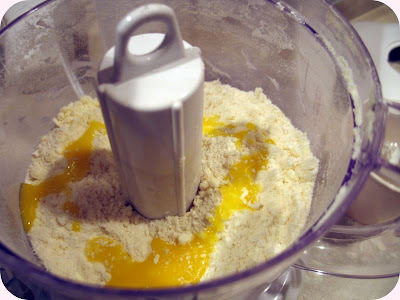 Pour the egg yolk over the top of the lumpy flour and butter mixture and mix on high for about 10-15 seconds. You want it to the point where it looks very well combined and big lumps are forming but you don't want it all sticking together in a ball. Dump the mixture into the prepared pan and pat it down evenly. Prick several times with a fork and place in the oven for 15-20 minutes or until the edges just start to get tan. 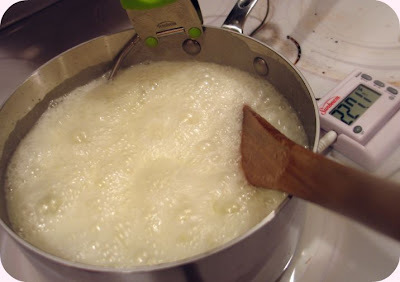 Combine the sugar, cream, milk, and salt in a medium saucepan. Cook over medium heat, stirring constantly until the sugar dissolves. Once the mixture begins to bubble, stir frequently until it reaches 235F on a candy thermometer, about 15 minutes. Remove the pan from the heat. *Carefully* stir in the vanilla and cashew butter; continue stirring vigorously for about 5 minutes, until the cashew butter has been completely absorbed, and the fudge is smooth, free of lumps, and very thick. Transfer the candy into the prepared pan, spreading it evenly with a rubber spatula. Set the dish aside for about 1 hour for the fudge to cool and harden. Melt the chocolate over a simmering pan of water or in the microwave on a very low power setting. When the chocolate has melted, add the butter. Gently mix together until it's well blended. 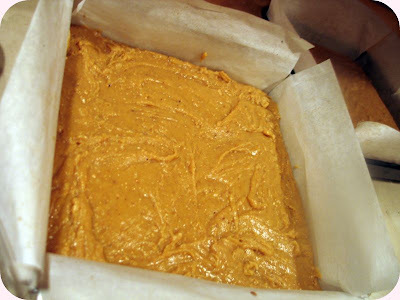 Pour the chocolate over the top of the cashew butter fudge layer, smoothing and shaking the pan. Let sit at least 20 minutes in the fridge until solid. If you can wait a solid 8 hours, that would be best. This gives the fudge and chocolate plenty of time to solidify. When you're ready to cut the bars, lift it out of its container by the waxed paper and set it on a cutting board. With a very sharp knife, slowly cut through all 3 layers. Clean your knife in between cuts for clean, sharp slices. Cut it into 1-inch squares. Store the fudge in an airtight container that has been lined with wax paper. Store in a cool or cold place. Ok, this is by far one of the best things I have ever tasted. I could eat and eat and eat and eat this until i couldn't eat anymore...and then I would save the rest for later. Loved it! Thanks for bringing some in today and sharing. This was very rich on top, but the lightness of the shortbread offset that richness nicely. It also helped that it had just the right amount of salt. It was a mature dessert because there was so much going on in it in terms of flavor, but still accessible to those of us who don't analyze each flavor but just enjoy the whole. Very enjoyable! I'm not usually a sweets person. But it looked so good I couldn't resist. I came to the office today just because I was hoping there would be a "Sugar-Shock" Friday announcement ~ Lucky me there was!! This is amazing and wonderfully delicious - we'll be trying this at home soon! OMG that was awesome! I love the salt, that makes them perfect. mmmmm. Delicious as always. You are so kind to always bring in your goodies :-) THANK YOU!!! It's not often that I get to combine "rich" and "subtle" when describing a desert item. Once again, I'm awestruck. wow. these look delicious. and lucky celeste, it sounds like a loving treat for a very deserving friend! I'm sorry to hear of the rough patch that your dear friend is going thru at this time. Hopefully things will take a turn of the better. 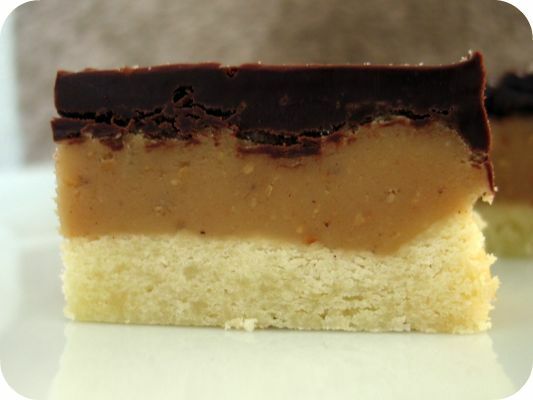 Your bars look terrific with their 3 distinct layers! I've yet to have a dessert that has sea salt sprinkled on top. 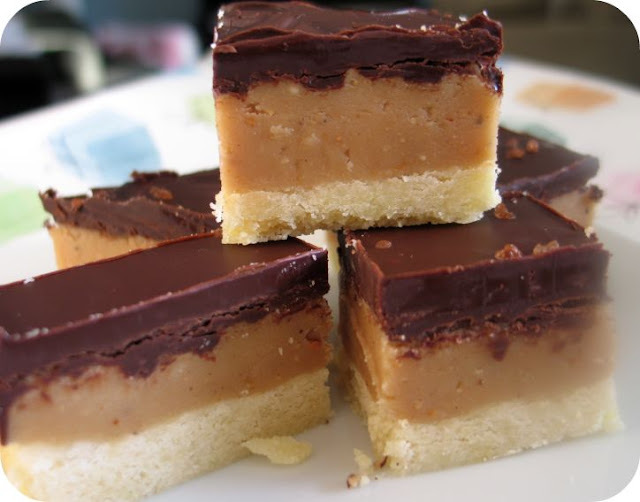 I will have to try and make this bars...they look so yummy! I've been taking the cake class at Michaels in Kirkland. I am fortunate to have a really good instructor. Her name is Dana. You should come by and take the class, it's a lot fun! that looks lovely but i dont have a mixer. will it work still? I wish you lived next door to me! Every recipe you post makes me wish I had enough time, energy, etc. to try each one. Your friend sounds like an amazing woman! And what a delicious treat - I would be in heaven. These look absolutely amazing. Thank you for the step by step photos IN the recipe! Very helpful. Nags - yes, you could definitely still make these. 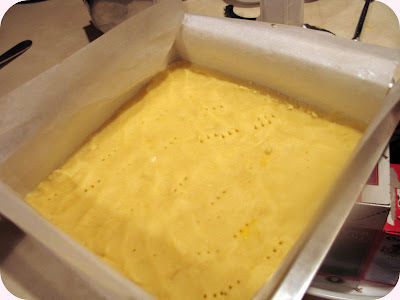 The shortbread can be made using a pasty cutter or two knives work just as well. Cut the butter into small pieces, sliding the knife blades across each other to catch all the pieces. 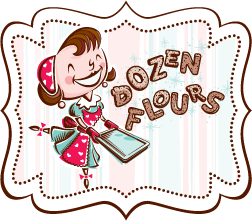 The pieces don't all have to be completely mixed into the flour, but they should be roughly the same size; you should end up with a crumbly texture. Continue using the knife technique even after your mix in the egg. This will take you several minutes to complete. That's really the only advantage of using a food processor. I'll try to get better at including more step-by-step photos in my posts. Sometimes its tricky multitasking -- for example, some of the photos in this post actually have a little butter on the lens! Thank you for sharing these with me. I love dark bittersweet chocolate and cashew flavor really enhanced that. Yummo!!! I am just sad that I missed them while I was MIA out of the office. :( Maybe next time around. I heard these were super yummy.